If you are just starting out with an information website about your company or your an individual looking to make a website to express yourself, the Home hosting account is for you, however, if you would like to open an online shop, setup a blog or run a forum on your website then the Advanced hosting account is ideal. Take a look through our comparison table below to see which package suits your needs. If you need help, please do not hesitate to give us a call on 0870 067 7065. UK Based Servers Our servers are placed on the SynergyWorks network placed at the heart of the UK internet. With our servers hosted in the prestigious Merdian Gate data centre in London, and with connectivity to multiple providers in a redundant fashion, you can be confident our hosting platform will meet your expectations. Web Based CPanel Cpanel offer a control panel for linux servers that give you as the user complete control over all aspects of your hosting account, it is easy to use and uses simple steps to create mail accounts, set up databases and install packages. Which features you have access to will depend on the package you choose. POP3 Mail Accounts Having an email address @'yourdomain' is essential for any business. With the POP3 mailboxes offered with our Linux Web Hosting UK accounts it is possible to create an email address for members of staff or a support email account for multiple customer service staff to view. Out of Office Autoresponders An autoresponder is an ideal way to communicate with your clients or friends when you are away for an extended period of time, autoresponders automatically generate an email with content of your choice to notify people that you are currently soaking up the sun in Barbados, and will be back on the 19th! 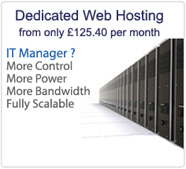 A must have for every Linux Web Hosting UK account and provided free of charge with ours. Catch-all/Default Email Aliases This allows you to automatically set 'all' email for 'yourdomain' to forward to one email address or mail box. Microsoft 2002 FrontPage Server Extensions FrontPage extensions are available on our Linux Web Hosting UK accounts. These extensions can be installed or uninstalled as required, having frontpage extensions installed allow you to use Microsoft's Frontpage website creation software. CGI Scripting In Perl The majority of CGI scripts that need to be installed on Linux Web Hosting UK accounts are scripts that allow you to have a counter displayed on your site or a guestbook that runs without a database in the background. Your Linux Web Hosting UK account has its own CGI directory that allows you to install and develop your own CGI scripts. We support CGI scripts written in Perl. For more information see : www.perl.com. SSI Server Side Includes Server Side Includes enable the addition of dynamic elements to your HTML web pages. Automatically insert dates, file information and other HTML documents. PHP 5 Scripting PHP 5 enables the use of .php pages on your Linux Web Hosting UK account that enables you to create dynamic elements on your HTML web pages and automatically store information in databases and add content to your webpages based on user input. PHP 5.2.6 is now available. For more information see : www.php.net. MySQL Databases MySQL is the most popular Open Source Database. It is fast, reliable and easy to use. For more information on MySql databases see : www.mysql.com. Our Linux Web Hosting UK accounts with CPanel feature phpMyAdmin which is the most popular web based MySQL manager.Version 5 now available. Sub Domains With your Linux Web Hosting UK account you can create subdomains for your domain e.g. support.yourdomain.co.uk which you can then create a separate website on, but without the accounts being on separate Linux Web Hosting UK account. Parked Domain Names By parking multiple domains on your Linux Web Hosting UK account your can have two domains displaying the same web site. Shared SSL Cert (Email Only) Access your email under a shared SSL certificate. This allows 128 bit encryption. However this doesn't enable you to access the site with https://server/yourusername for that feature you will need your own SSL. 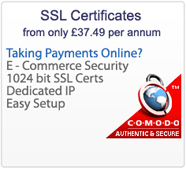 'yourdomain' SSL Access With your Linux Web Hosting UK account you can provide and set up your own SSL certificate. This allows 128 bit encryption of your web site traffic and is imperative if you want to take payments through your website. They will see the pad lock icon at the bottom of the screen to verify the connection is secure. The annual charge for provision and hosting of the SSL cert is :. Web Site Visitor Stats View real-time usage statistics for your web site from your Linux Web Hosting UK account, see how many people are visiting your site, where they come from, what search keywords they use to find you and more. You also have access to a bandwidth usage graphs and raw error logs. Password Protected Directories With your Linux Web Hosting UK account you may require to password certain content, with cpanel you can do such a thing easily. You can also create multiple users to gain access to the restricted area of your website. Easy to Install Scripts Various scripts are ready for you to install with a couple of clicks. Accounts with MySQL can also install WordPress , Joomla, Typo3, phpBB, CubeCart, OSCommerce and many more. Please see the Application self installation service for other software. Custom 404 Error Pages With all of our Linux Web Hosting UK accounts you have access to create customised error pages. There are simple steps to follow to have informative error pages shown on your site when a page isn't found. Unlimited FTP Access Linux Web Hosting UK accounts provide 24/7 access to your files, your upload space is only restricted by the Linux Web Hosting UK package you choose to register. Web Mail Web mail gives you access to your email from anywhere with an internet connection; this saves you having to rely on bringing your laptop or having to have access to your outlook to check your mail. 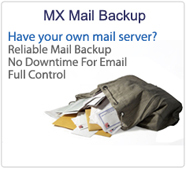 Webmail is access to your email through a webpage accessible from anywhere. File Manager Manage your files from your control panel. You can upload/add/edit any of your files from you control panel from any internet connected computer. Trouble Ticket Support Our ticket system mean your questions are logged and can be tracked easily to help make sure they are resolved as soon as possible. Instant Account Activation Place your order online and pay by credit card for instant account activation or call our sales office on 0870 067 7065. Reseller Hosting UK Reseller Hosting UK service from GLX provides superb support options as standard, with Whitelabel features, dedicated IP addresses, API automatic account creator so that your own Reseller Hosting UK service can be seamless and personalized to your business. Call us on 0870 067 7065.